Edible Arrangements has been recognizable for its fresh fruit creations since its inception in 1999. Now, the brand is adding a layer with the launch of a quick-service concept called Edible To Go. Edible To Go was officially introduced in February and features a “grab and go” menu including fruit salads, “Fruithies” (fresh fruit smoothies), FruSundaes, chocolate dipped fruit, parfaits, and natural, freshly-squeezed fruit beverages. As its sister brand centers on special occasion fruit bouquets often ordered ahead of time (walk-in orders have recently been accepted), Edible To Go is a quick and simple extension of that business and was inspired by a confluence of trends, including an increased demand for healthier food and faster service. Adding convenience to speed, the company has focused on opening the cobranded stores at malls and other high-visibility, high-foot traffic areas. These nontraditional locations also generate increased interest in the brands. The two brands have different marketing strategies and logos. However, they (for now) coexist under the same roof and pull from each other’s strengths – Edible To Go benefits from its parent company’s brand power, while Edible Arrangements is starting to see new business. Such progression came after extensive testing by the research and development team, which experimented with a range of products for the QSR market and eventually decided on all-natural items that don’t stray too far from the original Edible Arrangements concept. “We settled on the current product line because it stays true to our fresh fruit heritage, yet still offers an exciting variety of snacks and beverages,” Farid said. 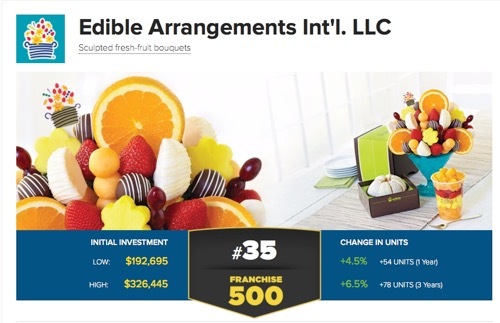 The timing for Edible To Go’s launch was influenced in large part to Edible Arrangements’ overall growth. The company recently turned in its most successful Mother’s Day week to date and recorded another double-digit increase in systemwide sales compared to the same period last year. Such accomplishments have also provided momentum for an aggressive expansion – the company plans on opening 150 new locations by the end of 2011, and another 200 locations in 2012. These new units will be a cross between standalone Edible Arrangements and those that are co-branded with the To Go concept. Edible Arrangements began franchising in 2001 and now includes nearly 1,000 locations in the U.S., Canada, Puerto Rico, Saudi Arabia, the United Arab Emirates, Kuwait, Qatar, Bahrain, Italy, Turkey, Hong Kong and Jordan. The new Edible To Go is already offered in the Middle East with “great success,” according to Farid, and is set to grow in Asia and South America. Jude and Gwendolyn, EA franchisees since August of 2007 currently own two Edible Arrangements stores, one at 20669 West Lake Houston Parkway, Suite E in Humble, Texas (281-852-1335) and another at 225 Main St in Houston (713-247-0700). They have recently signed an agreement to expand their business enterprise by opening four additional stores: two more in Houston, one in Baytown, and one in Pasadena, Texas. A new Edible Arrangements® store is coming soon to Johnson City, Tennessee! The new owners are Melissa and Nicholas . Melissa is a personal finance manager and Nicholas is a sales manager with a pharmaceutical company. Congratulations on signing on with Edible Arrangements and welcome to your next business venture!